Quarterly Or and Azure a cross fillet counter changed in the first quarter on a Rocky Mount Sable a Coconut Tree fructed proper in the second a Dominica Crapaud also proper in the third on Water Barry wavy in base a canoe with sail set all likewise proper in the fourth quarter on a Rocky Mount also sable a Banana Tree fructed also proper and for the crest. On a Wreath Argent and Azure a Rocky Mount Sable thereon a Lion Passant guardant Or and for the Supporters. On either side of Sisserou Parrot (Amazona Imperialis) proper beaked and membered or together with this motto APRES BONDIE C’EST LATER. 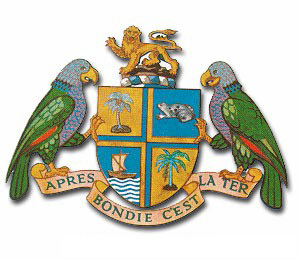 The Coat of Arms of Dominica bears the inscription “Apres Bondie C’est La Ter”, (After God the Earth), which emphasizes the importance of the soil in the island with its economy based on Agriculture. The design depicts a shield divided into four quarters of a cross, referring to the Island’s name, because of its discovery on a Sunday. In the first quarter on the top left, you see the black volcanic soil of Dominica supporting a coconut tree, and in the fourth quarter on bottom right a fully developed banana stem bearing a mature bunch of fruits is shown. Our Crapaud appears in the second quarter, while in the third quarter, a canoe under sea glides on the Caribbean Sea. A wreath of sliver and blue bears the crest, a golden lion standing upon a black rocky mount with the two Sisserou Parrots (Amazona Imperialis) as supporters.